1988 – A man in a green tracksuit arrives at a strip mall that he owns. He realizes someone has been using the bathroom without his permission. With shotgun in hand he enters a room and points it at the small gathering of people demanding to know the guilty culprit. He accidentally fires a shot in the ceiling amidst shrieks of the people now cowering on the floor, frightened out of their minds. Police sirens are heard approaching in the distance. James Brown, The Godfather of Soul, is that man. The practice of digitally encoding music and reusing it as part of another song is common practice today. They claim that James Brown is the most sampled artist of all time. In that vein, director Tate Taylor (The Help) gives us haphazard excerpts of a life. These vignettes are selected from different years at various intervals as if chosen from a buffet of life experiences. A detailed handling of the life of James Brown would be a formidable enterprise no doubt given the amount of material the man’s life would entail. Perhaps the filmmakers realized the task of accurately recounting the biography of a man with a long and complicated life would be too daunting. Nevertheless the disregard for chronology is odd. 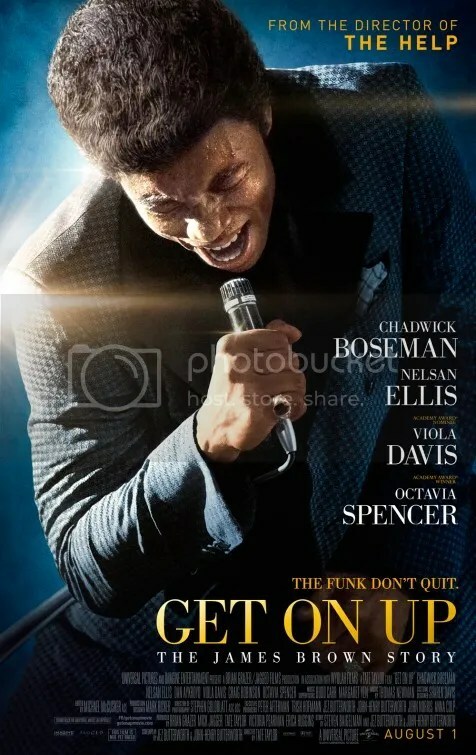 Get On Up is a biographical drama about the life of James Brown, where telling a traditional chronological tale is rejected in favor of emotional touchstones grouped by feeling. As a result, the saga never has a chance to build momentum. We start near the end where James Brown is already a legend in his own lifetime. People are chanting his name as he walks down a concert hall. As he reflects upon his life, we get the aforementioned run-in with the law. We see a sketch during the 60s where he’s nearly shot down, right before he’s entertaining the troops in Vietnam. 1939 – He’s a little boy running in the woods of South Carolina with his mother, Then he’s performing at a gig in 1964 with his singing group The Famous Flames preceding The Rolling Stones. Jill Scott plays Dee-Dee Jenkins, James Brown’s second wife. One minute they’re handing out gifts as Santa and Mrs. Claus. The next he’s beating her within an inch of her life. Before we can process what‘s happening, the narrative has moved on to another year. Flashback and flash forward. Back and forth, all over the place. The technique becomes particularly frustrating on the occasion where James is celebrating in his dressing room at the Apollo theater after a show. His mother, whom he hasn’t seen in years, walks in smiling. The power of that scene dissipates as it abruptly ends right there and we skim a myriad of other time periods instead, detailing different relationships with assorted women. All the while an alert viewer is wondering what exactly was the outcome of that fateful reunion of James Brown and his mother. We finally get the answer but it’s over 30 minutes later. In the interim, we come to realize how James Brown could be an effective mediator. A concert at The Boston Garden following the assassination of Martin Luther King Jr. is nearly cancelled for fear of riots. In an effort to diffuse a situation that has an excitable police presence on edge, he appeals to the crowd for order. James calms an excitable crowd whose dancing members keep getting up on stage. It’s a powerful moment. One thing is for sure. Get on Up is highlighted by some great acting. Let’s start with the supporting parts. Dan Aykroyd as his manager, Viola Davis as his mother, and Octavia Spencer as the Aunt who raised him – they’re all memorable. But none more so than actor Nelsan Ellis (TV’s True Blood) who matches Chadwick Boseman’s work for unadulterated emotional heft. While in prison, James Brown met the man that would change his life, Bobby Byrd. Wives and band members would come and go but his long suffering sidekick stood by his side through the best and worst times of his life. As one of the most moving relationships in James Brown career, it’s a poignant performance that lingers after the music has faded. Chadwick Boseman is impressive as James Brown. He fully embodies the man in vocal inflections, attitude and behavior. Boseman gets James’ signature raspy voice spot on, extending beyond mere mimicry. And when James sings! The musical performances are the best part. All of his hits are here including “Get Up Offa That Thing”, “Papa’s Got A Brand New Bag, Pt. 1”, and “I Got You (I Feel Good)”. The presentation relies on lip synching to actual James Brown tracks and personally I’m glad that decision was made. The singer’s idiosyncratic musical style would have been extremely difficult to duplicate. Chadwick Boseman gets the electricity of James’ delivery down pat, complete with the dancing, the splits and the sheer athleticism. People in my theater actually got up and danced. I’ve never seen that happen. Get on Up isn’t a deep film. It samples from the highlights of a very intricate life with a slapdash approach. I suppose the disjointed sampling is appropriate in an ironic way. It’s how his music is often manipulated today. However, it doesn’t lend itself to a dramatically affecting story arc, just a well acted one. Chadwick Boseman is indeed an actor to watch. This entry was posted on August 5, 2014 at 10:16 pm and is filed under Biography, Drama, Music with tags 2014. You can follow any responses to this entry through the RSS 2.0 feed. You can leave a response, or trackback from your own site. Boseman is amazing in this and really makes it worth watching. Even if I did like the film better than I had planned on doing, it still was his show for the winning. Good review Mark. Thanks. Boseman was Jackie Robinson last year in 42 and he was good but I’d say his performance in this is even better. His show indeed. Nice review Mark. This probably would have been a little more close to stellar with slightly more linearity, but still, it is such a well acted piece throughout filled with electricity. It’s early to speculate, but I’d expect Boseman to get some main award buzz. He’s that outstanding in this. I agree he’s outstanding. An Oscar nomination might be a bit of an uphill battle however. The Best Actor category is going to be tough. Steve Carell is already generating buzz for Foxcatcher and it’s not even out. Get On Up‘s early August release date doesn’t help and then it hasn’t caused much excitement among audiences. Yeah it’s probably a pipe dream. Early August release does no favors,but maybe it can sort of have a “Help-like” buzz, which earned a few noms being released in fairly the same calendar period. So, did they ever cut back to the days he abused his wife? Did he stop? Was he on drugs while doing that? What caused him to do that? I got the feeling the spousal abuse was something that continued at various times throughout his life. It doesn’t delve too deeply into such matters though. There is a reference to it right after he’s handing out presents to children dressed as Santa. He was not under the influence of any substances at the time. Sounds like some viewers really take that title literally! Dancing theatergoers, I could be down for this. . . truthfully I don’t know why I put it off. Great review as always! Thanks. Despite some very positive word-of-mouth, this failed to connect with audiences, earning less than $30 million at the box office. Take Walk the Line, another musical biopic, for comparison. It made almost $120 million and that was back in 2005, almost a decade ago. Boseman was Great! However, the movie was just ok. I really enjoyed the music though. Expected better. 3 1/2 stars. Yeah the musical numbers were my favorite part.